From Nate... he's compiled some information from the various links below. Corrections/additions are welcome. UV-3R, 3R+ (UV-100, UV-100 MKII, UV-200, UV-200 MKII, UV-3R MKII, Vero Electronics UV-X4. The improved Vero Electronics UV-X5 = TYT TH-UV3R probably belongs here too*). UV-5R, UV5R+, UV-5RA/X, UV-5RC/X, UV-5RE (and most re-branded clones such as the Ronson UV-8R, the Waccom WUV-5R . 409Shop models - UV5R[A-Q] ** belong here too. also if they have + or UU after the model number, it just means that the frequency range was extended by software on the UHF band from 400-470/480 to 400-520, not an improved firmware ). UV-B5, UV-B6, UV-82 (=UV82L), UV-82X (=144/220 Mhz model), UV-82C, (And probably the F11, BFUV66 and BFUV89 belong here too). GT-3, A-52, B-580T, BF-F8+ (Also BF-530I, BFE500S and maybe BF-F9+ ***). * Vero Electronics UV-X5 = TYT TH-UV3R probably has some small changes in the filter section, similar to what RadioMart\Martyn was trying to do with the TYT TH-UVF9 that probably became the TYT TH-UVF9D. *** Note the lack of [BAND] button on second gen radios that have the UV-5R form - the BF-F8+, the 409Shop's Baofeng BF-F9+ and possibly other clones that we will see in the future. I hope this will put an end to the Baofeng/Pofung model variation confusion. "I wanted to inform you on the progress of the TYT radio. Part of the delay is the original design did not have DTMF tone capability. This is something I informed TYT was really needed. They had to manufacture a totally new circuit board to add this, but they did it. The radios are being assembled right now and the shipment will be made by the end of April. I'll be the first US dealer with this radio and I'm pretty excited about it. When the TH-UV3R stock arrives, you will receive another email letting you know it's available to order. Pretty glad to see he has some influence on the manufacturer. AmateurRadio.com and Import Communications are at it again. This time they are giving away a TYT TH-UV3R. Click on over for rules and details. "Display will be regular LCD, not dot-matrix. (Disappointing news; takes away from its coolness factor.)" I agree with him. Is there anything else (keypad?) that makes this radio standout now? DTMF -- CTCSS -- DCS (DTMF feature will be added to later model)"
Kight Radio has updated their web page and says the TH-UV3R is "available now" with "delivery in 10 days or less." Import Communications still lists the radio as "coming soon." Ed is quickly living up to his new, broader name of Import Communications. 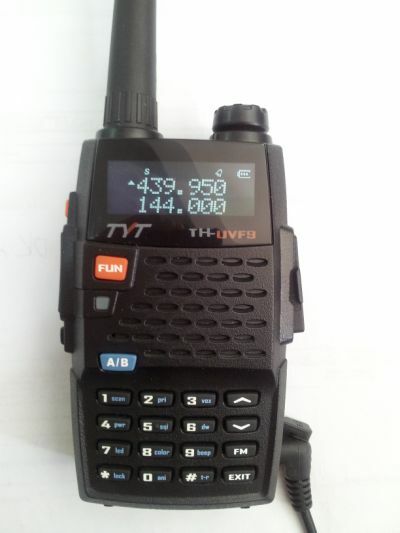 He has updated his website with a place holder for the TYT TH-UV3R (or UV-3R - it is listed both ways). The site says coming soon, but no date or price. The TYT TH-UV3R is getting the once over by the UV-3R group. "The TH-UVF9 is almost ready. It is not full of bugs, there was one little problem that has been solved and that had to do with the Ch Display / Freq Display. If you order one from Hong Kong, you may get the first production run which has that bug. When you order you want to be sure you get the latest production run. One thing Kight Radio will do, if you buy one that has a factory bug, when the new version comes out, we will exchange the radio for you at no charge. We have already done this with a couple customers for the TH-UV3R." Exchanging an early model radio for a new version is a fantastic service. It takes all the risk out of being an early adopter. Do I see a standard USB plug on the side of the TH-UV-3R? 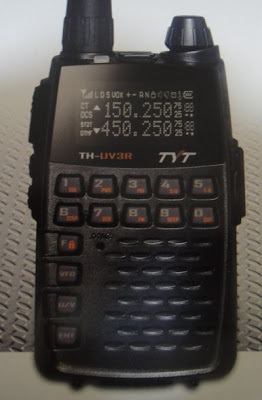 My previous post said that the HT in the picture looked like a TYT TH-UV3R, but Mike (G0CVZ) of UV3R.com has identified it as the Vero UV-X5 - a tri-band radio: 136-174, 400-470, 245-246 MHz.